As part of its missions, the Brussels-Capital Region’s Parking Agency, parking.brussels, has recently opened a map-viewing website dedicated to parking data. This interactive platform was developed by its observatory, which is also in charge of following up, monitoring and implementing Brussels’ parking policies. Its purpose is to facilitate access to and the exchange of regional-level information on parking availability (non-confidential public data). As part of its missions, the Brussels-Capital Region’s Parking Agency, parking.brussels, has recently opened a map-viewing website dedicated to parking data: https://data.parking.brussels/mapviewer. This interactive platform was developed by its Observatory, which is also in charge of following up, monitoring and implementing Brussels’ parking policies. Its purpose is to facilitate access to and the exchange of regional-level information on parking availability (non-confidential public data). These data include street parking (type, allocation, regulations, availability, demand, etc.) as well as off-street public infrastructures (mainly public car parks and park-and-ride facilities). They are derived from surveys, in particular on-site surveys, and are regularly amended and updated using a set of complementary sources, including: UrbIS-Ortho (orthophoto maps), related databases (e.g. Cycloparking), municipal regulations, municipal parking plans (PACS), parking surveys, various reports (mainly to/by the Agency’s and municipalities’ operating departments), etc. The platform comprises four main functions: viewing, access, calculation and interaction. This function enables the parking situation in the Brussels-Capital Region to be understood visually. For more detailed information, it is possible to zoom in. In default mode, the entire region is displayed, and the various roads and streets are colour-coded according to the parking regulations to which they are subject. 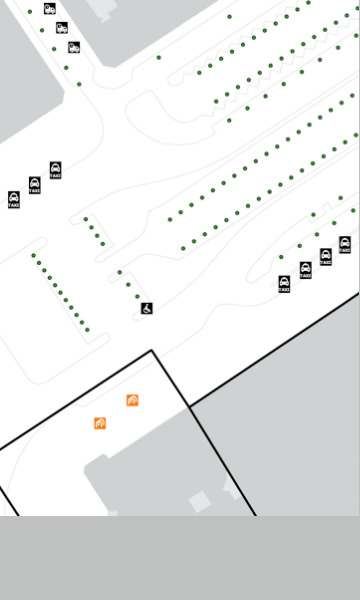 By zooming in, it is possible to view the precise location of each space as well as the spaces reserved for specific user categories (persons with reduced mobility, deliveries, bike racks, bike bays, etc.). A specific tool also enables users to selectively display various layers according to their requirements, adjust their transparency and load several different map bases (OpenStreet Map, Urbis and orthophoto maps). At this point in time, ten sets of data can be displayed and downloaded in various formats (shp, csv, json and xlsx): zones subject to regulations, roads accessible to motor vehicles, the corresponding demand (occupancy rate) at three key times (night, morning and evening), access roads on which it is possible to park, public car parks, park-and-ride facilities, bike racks and bike bays. The information displayed on-screen can also be exported in pdf format in the form of ready-to-use maps, complete with title, key, scale and date. The platform includes a calculation tool which enables parking reports to be made on demand and exported/downloaded in the form of a table. This tool is based on the ability to select areas such as municipalities or by tracing circles or polygons. Finally, the parking situation in Brussels changes every day: spaces are removed, reallocated or created. This application has been designed as a participative tool which enables its users (including road managers) to click on an object on the map and supply notification of any related errors or changes. Until the launch of data.parking.brussels, there was no dedicated computerised solution to supply appropriately detailed, reliable and fluid information concerning the parking situation in the Brussels Region. The first aim was therefore to make good this deficiency by centralising scattered information (among others from no less than 19 municipal portals) on a single, user-friendly platform, to improve access as well as readability and consistency. Beyond graphic integration, the platform was also designed as a tool which could be used for work and decision-making purposes via its data-supply functions such as downloading, spatial analysis and map export (see above). These functions, which are of use to the Parking Agency, the regional and municipal authorities, engineering and research centres, non-profit and local organisations and all interested persons in general, can be used to support a variety of actions. These include communication, customer service, reporting, the performance of studies and research, the assessment and updating of strategic plans (regional and municipal parking plans, mobility plans, car-sharing plans, development plans, etc. ), the performance of operational tasks (e.g. street inspections), the management of the temporary occupation of public streets, assistance to tenderers, etc. These actions are made all the easier as in the wake of the European legislation on the reuse of public-sector data (PSI Directive) and the Brussels Region’s own digital-transition, smart-city policy, the data published (which do not include personal data) can be freely accessed and are therefore available for any type of consultation or reuse (within the limits of compliance with the Brussels OpenData Licence). This explains why they are also supplied on the regional open-data platform (http://opendatastore.brussels), where they can be accessed in the form of web services. The platform, the purpose of which is to facilitate access to and use of data, was also developed to optimise data exchanges. This is the purpose of the module that enables its community of users to interact with mapped components by entering information concerning any related changes or errors (see above). This option was designed to support the update process and maximise the updating and reliability of the data supplied. It also enables municipalities as well as any other public-space stakeholder to quickly and easily fulfil the obligation (imposed by the Regional Parking Policy Plan) to supply notification of any removal of parking spaces on the streets. This operation is facilitated by the “point-by-point” display of available spaces at the most detailed level. Ultimately, data.parking.brussels is intended to contribute to the implementation by the Brussels-Capital Region of a service-oriented approach to its mobility policy (MaaS). Indeed, the various functions described above obviously contribute to the integration and simplification of information intended by this approach. They are also helping to prepare for the development of integrated mobility solutions (guidance, mode combinations, payment, etc.) and of new parking-management tools (scancar, secure bicycle-parking network, real-time occupation and appropriate dynamic pricing, etc.). Beyond any potential new functions and the regular updating of the information already available, new data could therefore be gradually added to the platform, whether from on-site surveys (rotation, time spent searching for a space, etc.) or new technologies (sensors, cameras, etc.). This article was first published in the 52th issue of Le Moniteur de la Mobilité et de la Sécurité routière. You can find a download link to this publication here.